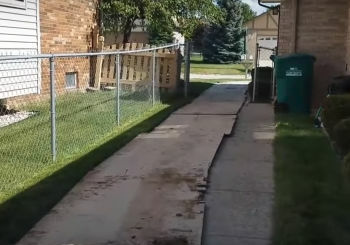 Okay, we’re at the location where the French drain terminates. You can see that all the stone has been encased with filter fabric, a heavy eight ounce commercial rated filter fabric. You want a six-foot roll of fabric. That way you can go down both sides of the trench across the bottom and fold over the top of the stone. This prevents any contaminants to get into the system. 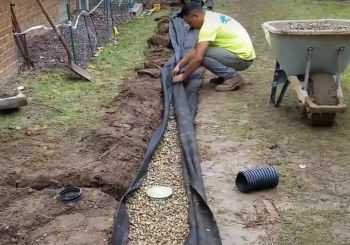 This is a fully contained French drain system. This system will not require maintenance of any kind. Now downspouts, how do you handle downspouts? You want to take a solid pipe and you want to go to a pop-up. You do not want to tie into the main. 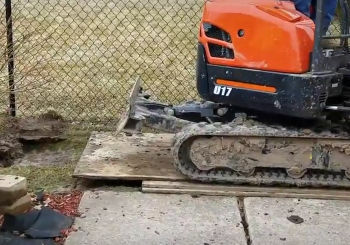 You just want to put that on top of your French drain. You want to put plenty of fabric around that pop-up and then the grass goes around that. Now shingled gravel, leaves, or debris end up coming off the roof, out of the pop-up. They’re basically just going to end up in the grass opposed to your French drain pipe. This is going to avoid maintenance, the system not being able to move as much water. You can see just how much don’t we put in our French drains. The stone is the key. 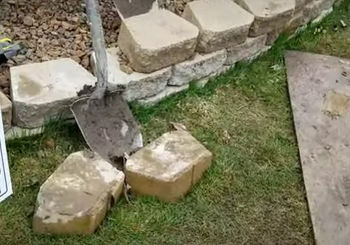 The more stone, the better the French drain. 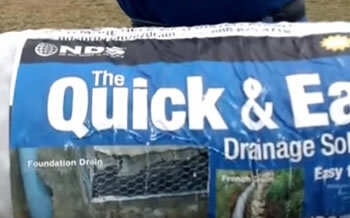 The more volume of water you can move, the more efficient the French drain is. 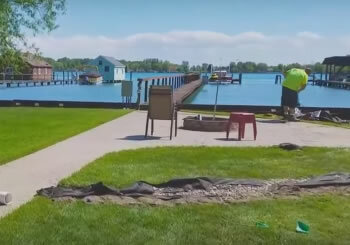 For all your yard water solutions, give us a call at 248-505-3065.